If I left you hanging (or salivating), I apologize. I did go off to Maine. My husband and I did buy a house-in Harpswell. If you are not acquainted with this quaint coastal community, read about it here, or better yet come visit us! And I did take time out to demolish a lobster roll. 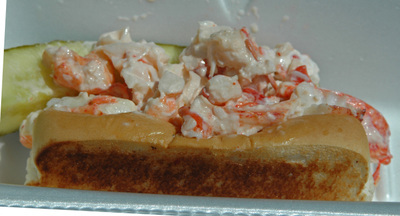 So what is it about this “sandwich” that people drive for hours so they can have “the best lobster roll in Maine”; engage in heated discussion about the other ingredients besides chunks of succulent lobster meat or whether it should be served hot or cold; and pay $16 and up for lobster on a hot dog bun? The answer: I’m not at all sure. For some people, it just seems like the thing to do-something like, when in Maine… For others, I suspect they crave the familiarity and comfort of their particular tradition-whether it is stopping at the first convenience store after crossing over the state line into Maine or making the trek (I’ve heard of people driving 12 hours) to Red’s Eats where they stand in a line that often wraps around the corner. Red's boasts that each lobster roll contains all the meat from a one-pound lobster and more. And lastly, some folks just plain love the taste of lobster-any way they can get it. For me, I suppose it is a combination of all of the above. I admit it: my name is Ronnie and I have stood in line at Red’s. I have stopped at convenience stores to get my lobster roll fix and I have just begun to take the seafood stroll down the Harpswell Peninsula. I like mine with huge chunks of lobster mixed with a small amount of mayo- just enough to hold the lobster together and then piled high on a lightly toasted hot dog bun drizzled with warm, melted butter. Pure decadence. Eat in or take out-it all works for me. How about you? How far will you travel for a good lobster roll? Hot or cold? Mayo? What's your image of the perfect lobster roll? I'll travel as far as Red's, for sure -- I've done that many times, though not yet this summer, so it's wonderful to see your photo! I'll travel to Harpswell, Maine, for a good lobster roll. Already have our tickets -- so count on it! Glad to see the update. Had we not seen you this weekend, I might have suspected foul play. Your writing, like your hospitality, is delicious. You have a reader & friend in Hot-Lanta (and I do mean hot) who will be on your doorstep every chance he gets. Save some lobster for me! I have never been to Maine and I have never had a lobster roll thou I have heard about them. I look forward to my first bite. Harpswell looks like a grand place to live and Red's Eats looks delightful. Lydia, put Red's on your calendar for next summer. We'll meet you there. Christie, we can't wait for you to see the house. Paul and Deborah, thanks for the kind words. Willa, come on down as they say in your neck of the woods. 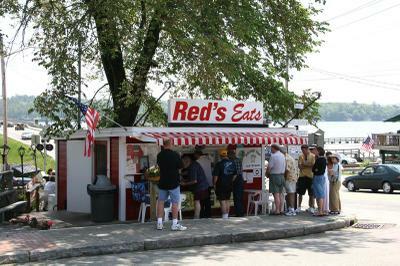 I've never been to Red's,but growing up in RI, we had our share of lobster rolls. I think it's more the experience than the actual food that most people relish, sort of like quahogs in RI. Congratulations on your new home; I wish you all the best! I've been there and am now craving a lobster roll. Such warm fuzzy memories come to mind just remembering the delicate meat and soft roll.....yummy! Well, we have lobster rolls in New Hampshire and there's the same frenzy here over them...even though we're on a lake and have our fish shipped in from Maine! Who can figure it! I am from Tennessee. I have seen the lobster rolls on TV and have been craving them. Can you have them shipped?